In my print making class, one assignment we had to do (blogged here) was set some type & print it. The type was to be our favorite quote & the goal was to print an edition of 21 (20 for us & 1 for our instructor). 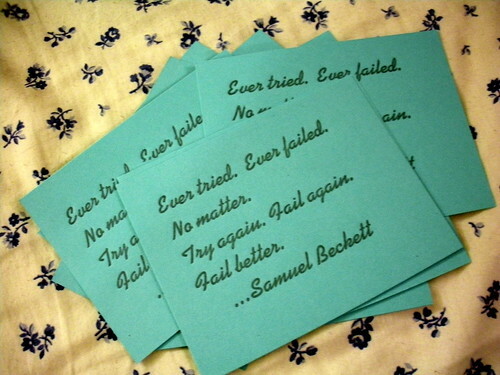 My quote is a Samuel Becket quote. I plan on framing a few & giving them as gifts. They will be put on patterned scrapbook paper (probably) then framed. I'll keep one for my self of course, but the others may get used in a collage or something, I am not sure yet. I knew I loved this quote & what it meant but I never thought about how it exactly applied to me. I always thought about it in theory. Well if you check out this post on Cross My Hooks, you'll see one of the many art projects I am working on. Well, long story short, while completing this project we were one part of the process short & thus it wasn't working correctly. Once we remedied the problem it worked perfect. It wasn't until that moment that I realized that the quote is true & not just in theory! We tried, we failed. We tried again. The second try wasn't perfect but it was a better failure than the first time & we progressed! Now we can pour these sheets out no problem. Hooray! Do you have a favorite quote?? One that you really feel is most definitely true? PS. Check out the link parties in the side bar or click here! Such a great quote ! Thanks for sharing.